As a tv reporter and photojournalist, I have traveled the world and covered some pretty horrific events: A tsunami in South East Asia, Hurricane Katrina, earthquake devastation in Haiti and too many more tragedies to mention. But Superstorm Sandy was different. I grew up in New York City and have lived in the tri-state area for most of my life. “Sandy” stole the homes and hearts of tens of thousands of people and my friends and family were not spared. Like September 11, 2001 – the tri-state area was forever changed. The Superstorm that came ashore on October 29, 2012 had all the elements that meteorologists are still talking about: A full moon, a high tide, and the combination of several storms. She barreled into the Jersey shore and pushed storm tides through the streets of New York City. When the skies finally clear and Wall Street opened back up, there was 65 billion dollars in damages. Eighteen months later – there is still debris in the streets from New York, to the Jersey shore and into Connecticut. I have toured many of these neighborhoods and spoken to hundreds of homeless families. As a reporter, I find it amazing that if you travel west of Pennsylvania that Sandy isn’t “news” anymore. I’ve even heard people say, “It was only summer homes that were damaged” or “New Yorkers have a lot of money. They’ll be okay.” But that couldn’t be further from the truth. Most of the towns that were destroyed were working class neighborhoods and many were underinsured or uninsured. There is still so much help that is needed. I am proud to say that “Surviving Sandy” is providing some of that help. 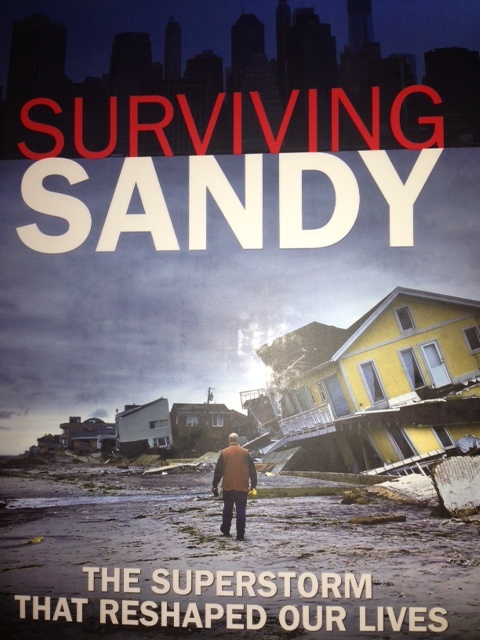 Surviving Sandy is a 300-page book that is giving back to those in need. The book was created from the hearts of children who attend the Pascack Valley Learning Center. The school draws students from New York, New Jersey and Connecticut – all of whom were affected by Sandy. In the days following the storm, the students began to collect stories from survivors and the idea to create a book was born. One of the parents was even able to secure funding. But – they needed help from a professional journalist to oversee the book. That’s where I fit in. The Surviving Sandy team contacted me to contribute stories and photos and the creative team of Four Color Planet was also brought on board. I had plenty to contribute as I was working in Union Beach, New Jersey when Sandy hit home. The book is incredible – not because of my involvement – but because of its’ heart. 100% of the proceeds are being donated to various charities which are dedicated to the ongoing rebuilding efforts. So far – five charities have received $1,000 checks including: Red Cross, FDNY Foundation, New York Says Thank You, Tunnels to the Towers Foundation and the Hurricane Sandy NJ Relief Fund. The idea is to sell more books and identify corporate sponsors who will donate a Surviving Sandy book to each public and school library that “survived” Sandy’s wrath. It’s a pretty simple idea: The more books that are sold – the more dollars that can be donated. The reaction to the book has been emotional. Even though we all saw the tv images, many are overwhelmed by the photos and stories. And while there are stories of loss, the book celebrates hope, the heroes and rebuilding. One story still upsets me. Frank the “fisherman”used to supply all the restaurant Rockaway, New York with his “catch” of the day. Sandy destroyed his home, two vans and his boat. All the restaurants closed down. Frank had spent nearly half a century as a fisherman. Most of equipment was old and not “worth” much to anyone but Frank. FEMA only gave him $38,000. The Surviving Sandy team is also hoping to help individuals – like Frank – in the weeks and months to come. Surviving Sandy also highlights heroes like my friend, Police Chief Tommy Boyd from Seaside Heights, NJ. Tommy is credited with saving 36 lives on the night of the storm. The marine biologists from Jenkinsons Aquarium are highlighted for risking their lives and sleeping at the aquarium on the night of the storm. Because of their stories, every animal was saved. And there are stories of rebuilding. The New York Says Thank You foundation has rebuilt 100 homes of first responders, firefighters, and police officers. So – while many of the photos and stories may put a tear in your eyes, there are also many tears of joy to be shared. And so this book that was created by the hearts of children is now healing some hearts. On behalf of the entire Surviving Sandy team, for those whose hearts were broken by Sandy, we dedicate this book to you. And for those who gave their hearts to rebuild and help others, we thank you.